Highways in Greece are generally organized so that the odd-numbered highways are of north-south alignment and even numbered highways are of east-west alignment. However, there are many exceptions. The designation of some important roads of Greece as "national" was decided by a 1955 decree, while a minister's decision in 1963 determined the numbering of these roads. In 1998, a survey of the Hellenic Statistical Authority defined some new national roads that were constructed after the 1963 decision. Furthermore, motorway numbers in Greece are different and irrelevant to other highways' numbers. For example, Motorway 6 (A6) refers to the Attiki Odos motorway, while "GR-6" refers to National Road 6. With a total length of about 2.500 km as of 2017, Greece's motorway network is the biggest one in Southeastern Europe and one of the most advanced in Europe. Greece's motorway network has been extensively modernized throughout the 2000s and part of it is still under construction. Most of it was completed by early 2017. There are a total of 10 main routes throughout the Greek mainland and Crete, from which some feature numerous branches/auxiliary routes, as described in the listing below. Egnatia Odos Igoumenitsa, Ioannina, Grevena, Kozani, Veria, Thessaloniki, Kavala, Xanthi, Komotini, Alexandroupoli 670/670 km. Sections Trikala - & Lamia - Xyniada planned. Section Ioannina - Kakavia is under planning. Motorway 1 ( ) is the oldest and most important motorway of Greece, connecting the country's largest cities, Athens and Thessaloniki and passing through many important regions of Greece on a south-north direction. Section Chalastra - Evzonoi was constructed earlier as an expressway, with no upgrade planned. The full length of this motorway is around 553 km or 346 miles, including 14 km or 8.7 miles of shared route with the A2 (Egnatia Odos). Note that until recently, the "P" in "PAThE" referred to Patras, but the Patra – Athens section has now become part of the A8 (Olympia Odos) motorway, belonging to a different project. Motorway 11 ( ) is a branch of the Motorway 1, connecting it with the city of Chalcis. Motorway 12 ( ) is a planned branch of the Motorway 1, connecting it with the city of Volos. Upgrade of the pre-existing section is under way. Motorway 13 ( ) is a planned branch of the Motorway, from Thiva to Elefsina; connecting it with the Olympia Odos motorway and serving as a western bypass of Athens Metropolitan Area. A2 Motorway Tunnels between Kozani and Veria. Motorway 2 ( ), officially named Egnatia Odos, is a motorway situated in northern Greece, connecting several major cities on the way. It starts at the port of Igoumenitsa and ends at Kipoi border crossing with Turkey. Specifically, there are auxiliary routes to Albania and Bulgaria, with the main route leading to Turkey. The Republic of Macedonia is accessed through the A1 (PAThE), as described above, or via Motorway A27 (see below). Another auxiliary route runs close to the Evros river in the prefecture of the same name, reaching a point where Greece's, Turkey's and Bulgaria's borders meet. Some of those auxiliary routes are not yet motorways, but typical 2-lane expressways, although they are of considerably higher quality than other similar expressways in the rest of Greece. The project (including most of the auxiliary routes), was completed in 2009, with the length of the main route being 670 kilometers or 416 miles, making it the longest motorway in Greece. Motorway 25 (A25) is a branch of the A2 (Egnatia Odos) and lies between Thessaloniki to the Greek–Bulgarian border crossing, via Serres (taking over parts of the GR-12); and between Thessaloniki towards Nea Moudania, referred to in this part of its section as the Thessaloniki – Nea Moudania Motorway or Chalkidiki Motorway. As it passes through the eastern periphery of Thessaloniki the A25 becomes part of the Thessaloniki Inner Ring Road (Esoteriki Peripheriaki Odos, Greek: Εσωτερική Περιφερειακή Οδός). Motorway 27 (A27) is another branch of the A2 (Egnatia Odos), at Kozani which leads towards Ptolemaida and from there to Florina and the border crossing with the Republic of Macedonia at Niki. Within 2012 tenders were announced for the construction of the 14 kilometers section from Florina up to the border crossing with the Republic of Macedonia. Construction of this section started in 2013, finished in 2015 and it was opened to traffic on 20 May 2016. The Ptolemaida - Florina part is currently an expressway, planned to be upgraded to a motorway. Motorway 29 (A29) is a branch of the A2 (Egnatia Odos) motorway, connecting it with the city of Kastoria and the Greek–Albanian border crossing at Krystallopigi. Motorway 3 ( ), or the Central Greece Motorway is currently under construction starting from Lamia (at the A1) and ending at the A2 (Egnatia Odos), close to Grevena. It will be part of the E65 and be 175 kilometers or 109 miles long. Construction started in June 2007. Work was halted in 2011 due to economic problems of the construction companies but resumed in mid-2013. Construction of the section between Xyniada and Trikala is completed and was inaugurated on December 22, 2017, but construction date of the part from Kalampaka to the Egnatia Odos junction is yet unknown. Motorway 5 ( ), also referred to as the Ionia Odos, is a fully operational motorway since 3 August 2017 when its last section under construction was delivered to traffic. It starts from Ioannina at the A2 (Egnatia Odos) interchange, and ends at Rio, in Patras, after crossing the Corinthian Gulf through the Rio-Antirrio bridge. There, it connects to the A8 motorway (see below). The route passes through most of western continental Greece, along the Ionian Sea, hence its name "Ionia Odos". Work on the majority of the highway began in spring 2006 and would span six years, to be completed by 2012. Though, because of economic problems of the constructing companies, all construction works were halted in 2011, but since mid-2013 works on the whole of the 196 km motorway started again. The motorway was completed in August 2017. Motorway 52 (A52) is a branch of the A5 (Ionia Odos) connecting it with the island of Lefkada and the undersea-tunnel of Aktio, leading to Preveza. This motorway section is expected to serve the popular tourist region around the Ambracian Gulf. At 48.6 km (30.2 mi) long, the motorway was expected to finish in 2012, having started construction in 2009. Earthworks were largely completed by April 2012 but structures had not commenced as of that time. In mid-2013, works had begun again, but as of December 2016, problems with funding have kept the road largely behind schedule. The road is now expected to be completed by 2020. Motorway 6 ( ), or Attiki Odos forms part of the urban motorway network of Athens's metropolitan area. Its full length is 65 kilometres (40 mi) and it is also planned to be extended to various directions, bringing its total length to 141 km (88 mi). 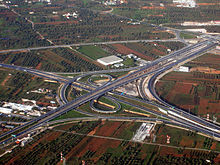 The Attiki Odos has various auxiliary routes, namely the Aigaleo Beltway (A65) and the Hymettus Beltway (A64), serving parts of western and eastern Athens respectively; while the 6 km (4 mi) section leading from the main route to the Athens International Airport is numbered as the A62. Motorway 62 (A62) is a section of the Attiki Odos which branches off at the end of the main A6 route. It basically serves as a corridor from Attiki Odos and Koropi towards the Athens International Airport. Motorway 64 (A64) is a section of the Attiki Odos which branches off the main A6 route. It is referred to as the Hymettus Beltway (A64) (Greek: Περιφερειακή Υμηττού), serving parts of eastern Athens, while it is also expected to be extended further southwards to Vouliagmeni and further eastwards towards Rafina. Motorway 65 (A65) is a second auxiliary route that branches off the main A6 route. The A64 section of the Attiki Odos is referred to as the Aigaleo Beltway (A65) (Greek: Περιφερειακή Αιγάλεω) and serves parts of western Athens. A small part of the A65 remains still unconstructed, and it is yet unknown when it will be completed. Motorway 642 (A642) is a small branch of Attiki Odos which connects Attiki Odos with Hymettus Beltway. It serves as a small detour of the main route and its length is 2 km. Motorway 7 ( ), known as the Moreas Motorway or Eastern Peloponnese motorway starts from Corinth, at the interchange with the A8 (Olympia Odos) and continues to Kalamata, passing through Tripoli. It replaced the old GR-7 as the main road, with the section between Corinth and Tripoli, constructed between 1984 and 1990 and officially becoming part of the Greek road network in 1992. The A7 has recently undergone extensive improvement to full motorway standards. As of December 2012, the motorway section between Corinth and Kalamata is fully constructed and operational. Its total length is 205 kilometers or 127 miles. Motorway 71 (A71) is a branch of the A7 (Moreas) motorway from Lefktro, connecting it with Sparta. It was opened on 18 April 2016. Motorway 8 ( ), referred to as the Olympia Odos, is the motorway from Athens to Patras. It begins in Elefsina, at the interchange with A6 (Attiki Odos) and will end in Patras. The Elefsina–Corinth section has been completed to motorway standards, while the Corinth – Patras section begun construction in 2008, and was due to be completed in 2012. After construction works had begun again the whole motorway was completed in 2017. It includes the widening and general reconstruction of the GR-8A along with some new tunnels and bridges. Motorway 90 ( ) is a temporary name for a motorway under construction in Crete. It is more widely known as North Road Axis of Crete (Greek: Βόρειος Οδικός Άξονας Κρήτης, BOAK) and is Greece's only motorway that is not on its mainland, but on an island. Certain parts have already been completed, as of summer 2007, at Heraklion and Chania. In late 2014, the Agios Nikolaos - Kalo Chorio part (which also serves as a bypass of Agios Nikolaos) was opened to traffic. Its full length will be 310 kilometres or 193 miles. Other sources claim it to be 250 km or 156 mi. The National Roads in Greece (Greek: Εθνικές Οδοί) are single carriageway or limited-access roads with one or two traffic lanes for each direction, usually with an emergency lane on each side as well. As of autumn 2017, most motorway construction projects all over Greece are completed. Part of the Central Greece Motorway was completed in late 2017 at a cost of 1,4 bn euros. Olympia Odos and Ionia Odos were both finished and opened to traffic in mid-2017 at a cost of 2,2 bn euros and 1,118 bn euros respectively. Moreas Motorway was completed in November 2016, costing a total of 1 bn euros. The final construction point of Motorway 1 at the Tempe Valley opened to traffic in April 2017, costing 1,3 bn euros. This is a list of European routes that shows which parts of them run through Greece. Note: When certain highways that carry European routes are replaced with motorways, the European routes will be reassigned to the new motorways. For example, GR-7 carried the E65 from Tripoli to Kalamata. When the Corinth – Tripoli – Kalamata motorway was completed, the E65 numbering was reassigned to it. ^ "Αυτοκινητόδρομοι: Δίκτυο 2.500 χιλιόμετρα μέχρι το 2017 - ypodomes.com". ^ a b c d e f g "Υποδομές - Το μοναδικό website για όλες τις υποδομές στην Ελλάδα - ypodomes.com". www.ypodomes.com. ^ a b c d e f "Motorways - Exit Lists Page". motorways-exitlists.com. ^ Dervou, Angeliki (2017-08-02). "The last section of "Ionia Odos" motorway to be fully put into operation". ERT International. Retrieved 2017-08-03.